Staff Photo by Allison Carter/Chattanooga Times Free Press Miles Ledford, assistant director of campus recreation, helps take a harness off of Matt Glowacki, a former member of the US Paralmpic team who was born without legs. He just finished doing a rock climbing demonstration at UTC's Aquatics and Recreation Center. Glowacki's life motto is "walking is overrated." His visit to UTC is a part of disability awareness month. Matt Glowacki has no legs. No, really, it's true. It's the first thing he announces when he takes the stage at the University of Tennessee at Chattanooga's University Center auditorium to give a talk titled "Diversity According to 'South Park' and 'Family Guy.' "
The second thing he announces is that "everything else is there and works just fine." Then he thanks the audience for laughing. Glowacki visited UTC that day as part of the school's observation of Disability Awareness Month, which they are addressing as Diversity Awareness Month. During October, various activities and presentations are taking place on the university campus. "We're trying to promote a community and campus of diversity," said Bryon Kluesner, director of the Office for Students With Disabilities. "We want the students and the campus to realize that even though [some students] may have a disability, they're going to be productive members of society even if they have certain challenges. This is our way of promoting differences within our group." Earlier this month, the office sponsored Adopt-a-Disability day, in which faculty and staff members paired up with students with disabilities and simulated the partnered disability. "It was really cool," said assistant director of alumni affairs Patrick Miles, who was paired with April Odom, a blind student. Miles wore a special eye covering that eliminated all sight, including peripheral vision. The two spent the day together, Odom holding the harness of her guide dog, Miles holding Odom's arm and using her walking cane. "It was literally the blind leading the blind," he said. "The one thing I really took away from the whole experience is the level of trust that April and others who have visual impairments must have with others. There are times throughout the day I had to rely on the fact that there was a person opening the door, that they weren't leading me into a wall or something like that." On a recent Monday morning, Glowacki visited the climbing wall at the university's Aquatic and Recreation Center. 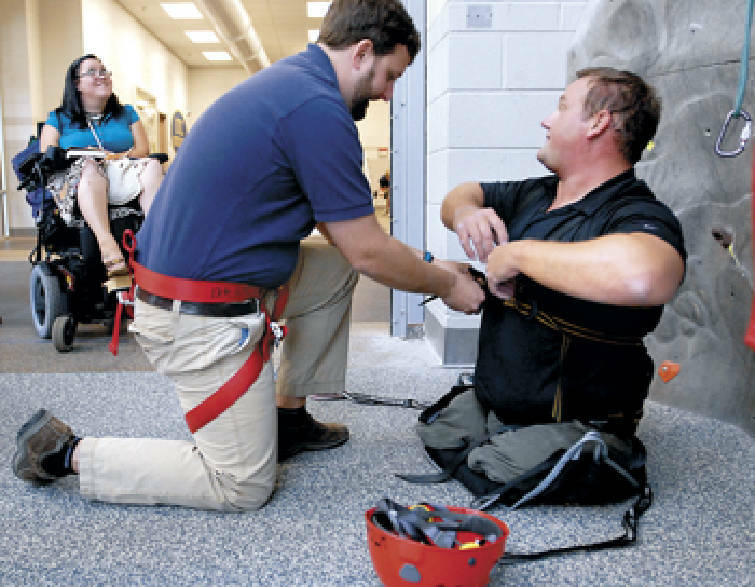 With the help of assistant director of campus recreation Miles Ledford, he was strapped into an adaptive harness and prepared for his ascent. Getting started was a bit of a struggle. Student staffer Eli Fowler was belaying -- anchoring Glowacki with a rope attached to the top of the climbing wall and tied in to both of their climbing harnesses -- and another student stepped in to help provide leverage. "What would you do," Glowacki joked. "Use your legs? What a novel idea." Student Eamon Hosey geared up and climbed along with Glowacki to assist. The two made their way up the wall, making it part of the way before the feat became too difficult. "I'm sorry, you guys," Glowacki said good-naturedly as he lowered down. "I thought I was more of a man." Jean-Marie Lawrence, who was watching the whole time, was plenty impressed, however. "I will definitely be here next week to try this," she said. A graduate student in secondary education, Lawrence, 23, has used a wheelchair full-time since she was 18. She said she came to see the demonstration so she could get a feel for rock climbing, something she wants to try. "It's on my top 10 list of things I probably shouldn't try, but I'm going to anyway. I already went skydiving and whitewater rafting." She was in the audience when Glowacki gave his talk, which used parody and satire to spread the message that "diversity is learning from differences," encouraging the audience to go beyond tolerance and embrace engagement. "It seems to me that my disability affects others more than it affects me," he said. "Have you ever been in a kindergarten classroom and seen the children engaging with each other? I know it's a little shiny and happy, but that's the world I want to live in." His way of life, he pointed out, is as normal for him as any able-bodied person's way of life is normal for that person. When people compliment him on his use of his wheelchair, he noted, he compliments their ability to walk proficiently. Using clips from "Family Guy" and "South Park" to help illustrate his points, Glowacki addressed three separate "isms" -- lookism, ableism and racism. He also discussed the downfalls of political correctness. "If we use the word 'crippled' or 'disabled' or 'special' or 'retarded,' we're setting up an expectation for what a person can actually do or can't do," he said in a phone interview. "The politically correct term is 'a person who has a disability.' But in my mind, that turn of phrase is still guilty. So when people say 'what do you want to be called,' I tell them 'Matt.' "
Anger, he said, is generally counterproductive. "Once you become angry, that's a bigger disability than not having any legs."